Jules: Yuyi Morales stopped by 7-Imp today! What a treat! Yes, lots of “!”s, but I’m excited. This is an image from her most recent title, Little Night (reviewed here in August by Yours Truly), a book with such sumptuous, gorgeous, dream-like artwork I can hardly stand it. Truly beautiful stuff. And it gets better! 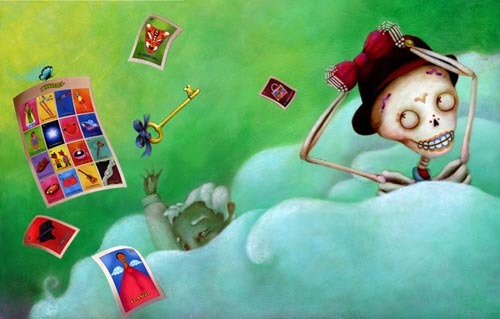 Yuyi is sharing, not one, but two images from her forthcoming picture book, Just in Case: A Trickster Tale and Alphabet Book, a Neal Porter Book, to be released in Fall 2008. Just under the illustrations is what Yuyi had to tell us about the new book. “I was in Mexico last year, walking with my husband, Tim, in the sultry streets of Veracruz, the city where we fell in love fourteen years ago. And as love conversations go, we were talking about stories–skeleton stories to be more specific. 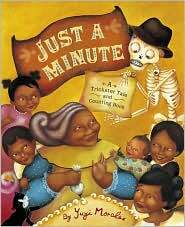 There is a lot of love in skeleton stories, especially if they are about candied skeletons like Señor Calavera, the main character in my book Just a Minute, who with his scary-goofy nature has helped me make beautiful connections with children. I had never considered doing a sequel to Just a Minute; I like moving on onto new things. But that morning the ancient Gulf of Mexico was singing by the dock, the humidity was making lichens grow on the 300 hundred-year old walls, and the wooden marimba was playing on the street. It is in moments like this one that old friends like Señor Calavera come back. ‘It could be an alphabet book,’ I said. ‘About bringing a present for Grandma Beetle’s birthday,’ Tim said. ‘Which would be what?’ I said. One thousand thanks to Yuyi for sharing these illustrations with us. I can’t wait to see the new book! In case you missed it, check out Yuyi’s fabulous, 3-D snowflake for the 2007 Robert’s Snow auctions, featuring Little Night herself. This link here at 7-Imp shows you a great picture of the snowflake, which plays music, and includes a video Yuyi made of the creation of her snowflake. Actually, it was for sale in Auction 1, which is over, I think, but you can still look and ooh and aah, yes? I’m keeping mine short this week, since we just celebrated Thanksgiving, and I’m sure that I probably rambled about what I’m thankful for. My kicks are generally that my family is safe and healthy and happy; that my husband had extra time off this week; that my girls are so much stinkin’ fun I almost can’t stand it; that I got to blog-read a lot this week, now that things have slowed down a bit; this roll call of great illustrators at a post at JJK’s blog; this write-up about Gregory K. Pincus and Fibs at the Poetry Foundation; and the fact that Alkelda sent me the soundtrack to “Donnie Darko” (she says it’s not available in the States, so I’m feeling kick-y to have it now. It rocks something serious, my friends. And so does Alkelda). Oh, I also really liked my Poetry Friday entry for this week, not ’cause it was terribly well-written or anything, but because it made me think of being in my 20s (when I read a lot of Thomas Merton) and ’cause that poem is gorgeous. Oh, and THOSE ILLUSTRATIONS THIS WEEK FROM MS. MORALES! Wow! Best kick of all. Ciao. 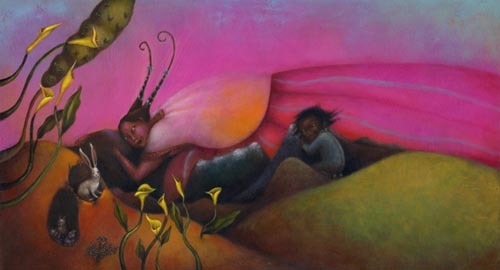 Ditto on the Yuyi Morales illustrations. I. Love. Her. 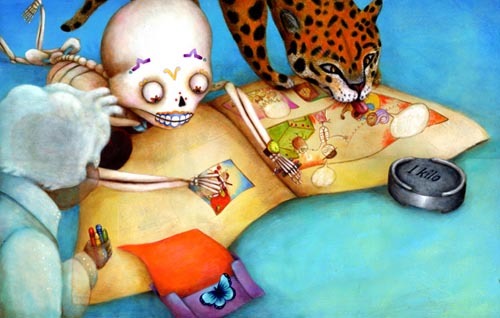 And I am so thrilled that there’s a new Señor Calavera book on the way. 1* First and foremost – we’re still alive. B. and I went to the Ikea in NJ this past weekend, in a big borrowed cargo van, to replace some furniture that didn’t fit in this apartment and such. Well, despite our obsessive planning and list-making, we spent basically 6 hours there Sunday afternoon (there’s just no such thing as a quick trip to Ikea, I’m telling you). By the time we got out of there, it was dark and starting to snow. No biggie, we thought, since we knew flurries were predicted for central NY. We did NOT expect the big crazy snow storm that this became. It finally got so bad that we just decided to pull over and check into a hotel somewhere in PA. It meant I would miss work (and a writing deadline) the next morning, but so be it. 2* Oh, and also, I had a job interview the following afternoon, which meant that we had to scramble home Monday morning to get me there in time. Which we did – barely. 3* But I think it went well, and I had a very nice time meeting with the entire library staff, a couple of faculty members, etc. 4* Thanksgiving: B. and I put together our new kitchen table and chairs (which fit perfectly in our teeny kitchen, and look even better than I thought they would) and made a ton of yummy food. 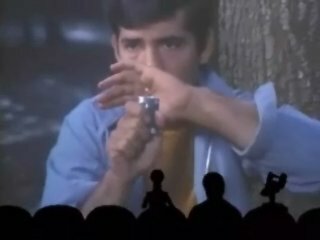 Then we ate while we watched Mystery Science Theater 3000 DVDs (our own Thanksgiving tradition, dating back to the “Turkey Day MST3K Marathon” thing they used to do on Comedy Central). Then we went upstairs to hang with the neighbors, eat pumpkin pie, and play with their Nintendo Wii. A perfect day. 5* Speaking of food, Wegmans has a Creme Brulee flavored ice cream that is totally amazing. It’s especially nice on apple pie. Just sayin’. 6* My temp assignment at the financial firm ended, and I got lots of lovely goodbyes and a sweet present from one of my co-workers. 7* I really hope Michele tunes in this week for this kick: B. and I borrowed the first season of the new Doctor Who on DVD, and yes, it really is all that. 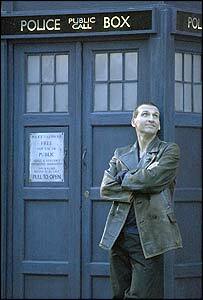 I’m still in the Christopher Eccleston period, though, so I still haven’t beheld the legendary David Tennant. I hope everyone else had a lovely Thanksgiving – or a plain ol’ lovely week, for our British/Aussie/Canadian readers. Please tell us about it, and any other kicks you might have. Oops – apologies, all. I thought I’d set this to publish a few hours ago, but apparently I didn’t. Carry on, carry on. Good call, Eisha. I wasn’t prepared to give you up for a truckload of Swedish furniture. 1. You know what’s kicky? I read the illustrator’s name in the title of this post, and I knew who you were talking about right away! I’m gettin’ educated! Seriously, I’m grateful for all the Robert’s Snow posts, and your featuring illustrators here. It’s like a big window into a whole world of joy and beauty. 2. I won a snowflake! Yes! My bid was accepted and I now await the glorious “Golden Snowflake” by Inga Poslitur. I love the way the young artist on the snowflake is creating her own snowy sky with her paint brush. 4. Making soup in bread bowls with my daughter and her boyfriend. I feel good about both of their educations, because they made those bread bowls both structurally strong and very beautiful. And they used up all the extra bread as herbed croutons and breadcrumbs. All I had to do was make the broccoli cheese soup. 5. Writing a sonnet. And it’s going to be part of a crown! 6. Reading The True Meaning of Smekday. J. Lo and Gratuity are the funniest pair of road buddies I’ve met in many a mile. 7. Hiking in the mountains where you start out cold and end up warm and happy. Sara, d’oh! I totally meant to add this week (and I forgot — well, I remembered at about 3 a.m., turning over in my sleep. This is how my brain works) that this is also one of my kicks: That just coming over here to report your kicks a while back inspired this. Your poetry always slays me. (Isn’t that the poem, or was it another one? I think that’s it). Hey, I’ve always wanted to make a bread bowl. Maybe I’ll try. So glad you got to spend time with the whole family. And having helped convert you — and TadMack — to picture books makes me very happy, indeed. Have you ever looked at 7-Imp’s “categories” in the right column of our template? 115 picture book reviews and way less novel reviews. I need to hop onto those novel reviews, but the picture books are . . . well, the joy and beauty you called it. I don’t even want to talk about the dearth of nonfiction reviews. CONGRATS ON THE SNOWFLAKE! Great one! YAY! Sara won a snowflake!!! Eisha, IKEA rocks once you get everything together. Glad you made it through a NY blizzard and back for a great interview. Sara, I cannot wait to read the crown sonnet. 1. Everyone’s wonderful comments on my Thanksgiving post. You guys are all amazing. 2. A good Thanksgiving with family. 3 & 4. Winning 2 snowflakes. I’m still in shock over this one…can’t tell hubby about this one for awhile. 6. The Mane Event by David Ezra Stein. Who would ever have thought? I now have my own bit of courage. 7. I went to the book store and bought the last copy of Sherman Alexie’s book, “The Absolutely True Diary of a Part-Time Indian.” How could I not? I brought it home and noticed the “autographed copy” sticker on it. So I have Sherman’s penned scrawl in my book! Vivian! You have a signed copy? I’m turning green. Sounds like Eisha & I had a similar Thanksgiving! Terry bought & put up a Christmas tree this week! We normally do this on Thanksgiving, but he got it up when we had the time. Woot! I loves me a Christmas tree. I got out of bed at 6:00a on Thanksgiving morning and braved the frigid Wyoming pre-dawn temps to stand in line at K-Mart for a Wii. I got one, and was back in bed by 7:10. That is the joy of living in a small town. Thanksgiving day…cooking, cooking, cooking. I love to cook, so it was a relaxing day of making cake, stuffing, turkey and gravy. Our friends Bill & Becka came over, we ate a super-tasty dinner, and spent the rest of the evening playing Wii Sports. Holy crap, it was so much fun. Julie, you’ll like this one…I got a package in the mail on Friday from our friend Scott (now Winston), whom I’ve known since the 6th grade. It was a couple of new CD’s of his music. I love getting mail, and mail from old friends is just awesome. Jules, Those illustrations are amazing! Now I am dying to see Just in Case. Awesome! Eisha, Jason and I got stuck in that snow in PA on the drive back from Baltimore Sunday night. It sucked, but it was also so, so beautiful driving through the mountains. It was this fantastic thick, white snow that coats everything. You did the sane thing stopping. We kept driving, stopping for more coffee every hour or so. Sara, Ooo! A snowflake! The soup in bread bowls sounds amazing. I love soup in bread bowls, although I’ve never made a bread bowl myself. I’ve tried making bread from time-to-time, but I don’t have a good knack for it. I can make good pita bread, though, which is like magic. Vivian, Ah, you got “Peach Heaven”! I wanted that one badly, but the price quickly got too high for my budget, particularly when my garage door decided to break in a permanent sort of way mid-week. I’m glad to see the snowflake ended up in good hands. Aside from being a wonderful artist, Yangsook was so completely and totally nice when I was emailing with her about Blogging for a Cure. 1. Thanksgiving. I love this holiday that is all about eating. I host at my house, and I love spending all the morning getting ready until people start showing up. This year, it was mostly friends, and we played games and did puzzles and ate a lot. It was very satisfying. 2. My father-in-law has been helping me out with the aforementioned garage door issue and a few other things around the house. He is unreasonably nice to me, and it’s help like this that keeps me safe and sound in my house. 3. I went to see Enchanted, and it was really entertaining, way more fun than I would have thought. 4. I also ate a garbage plate yesterday, which is a nice combination of fun and shocking. 5. Heroes finally got good again. I was starting to worry that they’d lost it. 6. Today, Lucas and I are going to see Muppets in Space on the big screen at the Dryden. I’ve been looking forward to this for weeks. 7. I got a new sweater that I really, really love. Hi Jules and Eisha! I’m glad you liked the DD music, Jules. A quick look at Amazon revealed that the soundtrack (with the songs, not just the score) is available to order as an import. 1) I’m not a Raffi fan, but I ordered the Raffi book Like Me and Like You (ill. by Lillian Hoban) after I heard Eric Ode sing it– it’s about different children in different countries, and “Farida lives in Pakistan.” A children’s book with my name in it is rare indeed! 2) I reserved my first organic Christmas tree. 3) I just got Nancy Farmer’s Land of the Silver Apples from the library. I loved Sea of Trolls. 4) Doctor Who season 3. 5) For my next gig, I’m getting paid in pies. 6) I had some quiet time to myself yesterday. 7) My daughter goes back to school on Monday– and the reason why this is a kick is because we were able to add another day to her school schedule. P.S. Adrienne– A garbage plate?!?! Please elaborate/explain. I’ve got some images going on here. Ooooh, creme brulee ice-cream (I like to focus on the imporant things). 1. One of my younger sisters is engaged! I like her boyfriend and think they are really well suited, so much happiness! 2. John Howard is no longer the prime minister of Australia! Yes! Such a highlight of the year (if not decade). 5. I bought a woolen hat and scarf spun and knitted from the wool from the flock of sheep I walk past most days – talk about local produce! (They are a lovely old breed of sheep, with cute horns). Also, today’s illustrations are amazing! Oh, cool illustrations today! I was planning this comment on my way home last night but I may have forgotten bits of it–though I must say, one big kick is that I spend time all week long thinking about what my kicks will be! #3: finished two big knitting projects, which means the decks are cleared (relatively) for Christmas knitting now. yay! #4: Thanksgiving with the family: three siblings, their partners, two nephews, and my parents. #5: more thanksgiving. I love everything about it. #7: time to read them. Alkelda, I don’t want to shock the healthy people, but a garbage plate is a Rochester specialty–home fries and macaroni salad topped with your choice of a burger or hot dogs (they now do these with veggie burgers or veggie hot dogs, which I can’t eat because they’re made out of soy, but still). The whole thing is then topped with hot sauce and maybe onions and peppers. You hardly need me to point out how terribly unhealthy this is. I only eat a garbage plate once or twice a year, usually in conjunction with either a celebration or great stress. Hello all! In that last month I’ve had my entire family come to visit, starting with my parents, then my sister and her family, and still with me now, my brother and his family. I was so homesick, but these visits have all helped. That is, until Eisha mentioned Wegman’s (boy do I miss that place) and Adrienne had to brag on going to Nick Tahou’s for a garbage plate. I haven’t lived in upstate NY in 13 and a half years, and I still miss it like crazy. I do NOT, however, miss the snow. I’m so glad everyone had such wonderful weeks. Here are my kicks. 1. I bid frequently on David Ezra Stein’s snowflake, but I can’t be disappointed that I lost it to Vivian, because I won her sock monkey fairy contest! 2. I also won the grand prize in Elaine’s Blogging for a Cure contest and won a a limited edition Robert’s Snow giclee print signed by Grace Lin. 3. I too will be joining Sara and some other amazing blogging poets to create a crown sonnet. I’m scared to death, but excited as well. 4. Good food and family for Thanksgiving. What a treat. 5. Absolutely no shopping after the holiday! 6. We had lazy days full of reading, doing puzzles, and longs walks. 7. Reading like crazy for the Cybils, and enjoying every minute. My only regret is that our panel can’t meet in person. I’d love to sit with them and discuss our choices. That’s it for me. Have a great week, all! Adrienne, the bar-b-que place near here serves a sampler plate of ribs, chicken, pulled pork, corn, slaw, etc . ON a garbage can lid. I thought that’s what you meant. Just in case you need to know more, here’s the skinny on Nick Tahou’s garbage plate. What wonderfully fun illustrations this week. It sounds like everyone had a fabulous holiday. Congrats to Sara and Vivian for winning a snowflake. I soon realized that I would be wishing on a star to make payment of one. But I hope a lot of money is being raised. Emmaco, proper afternoon tea, scones and lemon curd? Where do you live? Can I join you? I have to go and heat water for tea now. 1. Thanksgiviing, of course. Friends and family, the best. The pumpkin pie with a rice flour crust turned out fabluous. 2. Shopping on Black Friday (although I don’t do much and I don’t get up too early, was at the store by 7 AM). 3. House decorations are up. 4. My granddaughter’s birthday party. 5. Have begun 19 Minutes by Piccoult. 6.Looking at photos in preparation of Christmas gifts. 2) Stir-fry peppers (any color). 3) Mix them together, coating the veggies with a sprinkling of olive oil. 4) Toss the whole thing out the window and order a pizza. Akelda, you cracked me up. That sounds exactly like my recipe for baking anything. Also, I loved Nancy Farmer’s House of the Scorpion. Let me know how the new one is. And congrats on hearing your name in a song! I totally get how special that must be. Congrats to Sara and Vivian on winning their snowflakes, and on contributing to a great cause in the process. Tracy – I totally did not get the appeal of the Wii until Thanksgiving. But the fact that you get to CREATE A CHARACTER THAT LOOKS LIKE YOU and that’s who plays all the games? Awesome! And we did the sports too – I was pretty good at bowling, lousy at baseball. Adrienne, I DO love Wegmans. And yes, Monday morning as we were driving home, the snow had slowed down enough that we could actually see, and it was just gorgeous – all the trees were coated, and the mountains all around… almost worth the danger. Emmaco, congrats to your sister – glad you approve of the boy, too. And proper tea! How cool! Libby, I’m with you on the piles of books, and I envy you the time to read them. I can never seem to get that combination right. Tricia, I’m still jealous about that sock monkey fairy. And I wish our panel could all sit down and talk books, too! Jone, you’re so brave to go shopping on Black Friday. I barely left the apartment. And happy birthday to your granddaughter! 1. Mheir and I watched our first Christmas movie last night (Elf). We always try to get through as many of our collection as we can before the holiday. 2. We spent a lovely Thanksgiving with friends in San Luis Obispo – great food, great wine, great company, and card-playing into the evening. 3. I got to watch Mheir reading multiple books to our friends’ 20 month old son, and I was so happy to see both of them enjoying themselves. 4. I was the first person to review the dead & the gone, companion novel to Susan Beth Pfeffer’s Life As We Knew It. It was a bit unfair of me, since the book doesn’t come out until June, but I just couldn’t resist. I was very careful about spoilers, and I’ll write about it again closer to publication date. 5. I just recently started having people come and clean my house, and every time they come they seem to find some new project to surprise me with. This week they cleaned the oven (which I had auto-cleaned, but it had lots of ash in it), and it just made me so pleased with my decision to hire them. 6. My little Growing Bookworms newsletter is up to 80 subscribers. It pleases me that there are 80 people who are interested enough in children’s books and raising readers to go through the slightly tedious sign-up process. 7. Cybils nominations closed, and we’re up about 17% in number of nominated titles from last year. And Tracy Grand’s Cybils widget is very cool. Wow, I thought it’d be quiet today, since it’s a holiday weekend for most people. First, I wanted to quickly share that Yuyi has her own kicks posted here. Wahoo! I didn’t even know she had a blog. Or, if I did, I forgot, which is how my brain works these days. Anyway, thanks to her for listing kix, as Alkelda so economically spells it. I’ll say it again: Aren’t those new illustrations of hers so great? Man, I am in love with them. Those colors. The design. The magic. Everything. Vivian, congrats on the snowflakes! They were both really great ones. You must be so excited! Yuyi mentioned in her post that hers was auctioned off, too. Remember that beautiful thing? TRACY, OMIGOD HI! You heard from Scott/Winston? How is he? I guess I should email you offline. What the hell is a Wii, people? Adrienne, Muppets in Space on the big screen? Man, I’m jealous. I want to do that with my girls. I looked into Nutcracker tickets at Nashville’s big performing arts center so that I could take my 3.5 year old, but to sit up front in an orchestra row was entirely, entirely too expensive. Wah. I think if I got the balcony tickets I could afford, she’d get unfocused too fast. I’ll just save up for next year. I think she might enjoy a ballet. Alkelda, I want someone to pay me in pies. Duuuude. After you get them, you must share what kind(s) you get. Libby, I understand the joys of having more time to read. I have a bit of that myself now. Lovin’ it. Glad you made it back safely from all your travelling. Tricia, congrats again on your Grace Lin print. And I’m starting to think that a brilliant-and/or-amusing-thing-William-has-said story is going to have to be required for every kicks list, ’cause I look forward to them. Don’t let Eisha fool you with that cooking comment. She is a great cook. We used to be roommates. And my husband just told me what a Wii is. So I’m good to go on that. Jone, happy birthday to your granddaughter! Jen, I missed your post on Pfeffer’s sequel. Must go read. Congrats again on your newsletter. 80 is good. Very good. Oh, and “Elf” makes me laugh so hard, I can hardly stand it. As Adrienne would say, best. thing. ever. The escalator and drinking-all-the-Coke scenes crack me up. As in, the first time I saw them in the movie theater with my nephew, I could. not. stop. laughing long after the scenes were over. I was very embarrassed. People were staring. Will Ferrell could just stand there and do nothing, and I’d laugh. He’s achingly funny to me. J., I can cook, sorta, but I totally cannot bake. Baking is like chemistry, which I failed in high school. And that’s why I wouldn’t mind being paid in pies, either. Jen, if I ever get to the point where I can pay other people to clean for me, I will do it in a heartbeat. That seems like the best thing ever. Alkelda, That made me laugh out loud so hard, my cats ran away. Tricia, Sorry to cause you homesickness! I guess a garbage plate wouldn’t travel well, eh? Wegmans *is* getting closer and closer to you, though. What was interesting to me about the Wegmans near Baltimore is that it didn’t look like a Wegmans at all. I think that’s part of why I was bothered by it. I wonder if they’re different on the inside, too, or if the service is the same in other areas. Jules, Muppets in Space might be the worst of the Muppet movies, but it was fun even so. The theater (which is, incidentally, the same theater where I saw Evil Dead 2 last month) is doing a whole Muppet series and will be showing Muppet Treasure Island in a couple weeks and Emmet Otter’s Jug Band Christmas the weekend before Christmas. Lucas and I are planning to see both. I would *love* to take Lucas to see The Nutcracker, but he’s never seemed like he would be ready/open to it. I think I have hope with the little one in a couple years. Max likes much more mellow music and seems more open to things in general. We’ll see. Jules and Eisha both said “best thing ever.” Another kick for me! Agreed on Will Farrell, Jules. And Eisha, it took me a very long time to justify cleaners, but I’m glad that I did. Oh, and Adrienne, bonus kick, we just bought tickets to the Nutcracker for this year. We try to go every year, though it doesn’t always work out. I’m sure Lucas will be ready eventually. I did not win a snowflake or a sock monkey, but I’m gettin’ a kick out of the fact that some of you did. Also, I got a kick of feeling grateful alllll week instead of just on Thursday. Also, I love long weekends. Also, I love it when my kids go back to school at the end of long weekends. Also and finally I am sooo psyched about the powerful group of poet bloggers who’ve agreed to write a crown sonnet with me!!!! have just linked your marvelous interview to a small post celebrating the big brilliant talent that Yuyi brings to all things! thank you for doing, as ever, another great 7 Impossible job on this!